The newest trend in the beauty world isn’t a crazy expensive invasive treatment at your dermatologist’s office or a ridiculous way to do your eyebrows. It is much more natural and simple. The latest craze is harnessing the power of cannabis to create amazing top hemp cosmetics and CBD beauty products to improve your skin. That’s right, the benefits of cannabis are never ending. It is not only used for recreation and medicinal purposes but now it can also be found in your beauty products. Although seeing hemp seed oil listed on some product ingredient lists isn’t new, the beauty industry is now starting to use CBD oil as well to create effective and “high” quality products. In this article, we are going to discuss everything you need to know about this trendy new ingredient and why it is changing the game in the beauty world. We will also get into why companies are having issues bringing these great products to you. You can even learn how to make your own DIY beauty products with CBD oil. Don’t forget about hemp seed oil though! We will talk about why hemp seed oil has been used in products for so long and the benefits it offers for your skin. You will find a list of our top hemp cosmetic products at the end of this article. 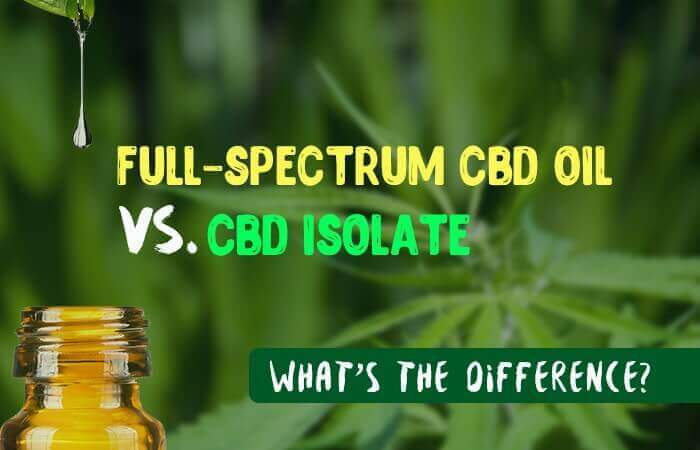 1 What is the Difference Between Hemp Seed Oil and CBD Oil? 3 Can I Buy Beauty Products with CBD Oil from Amazon? 5 Who Is Carrying CBD Products? Many companies are creating creams, shampoos, lip balms, and more with hemp seed oil or CBD oil to bring the natural benefits that these oils offer to their customers. Although both of these oils are often confused for each other, they are different products. Hemp seed oil is taken from the seeds of cannabis sativa plants that are classified as industrial hemp. The seeds do not contain tetrahydrocannabinol, THC. This is the cannabinoid in cannabis that gives you the high/euphoric feeling. The industrial hemp plant itself contains little THC throughout the entire plant, in order for a cannabis plant to be considered hemp it must have less than a 0.3% THC concentration. The seeds also contain little to no cannabidiol, CBD, as this is produced in a different part of the plant. The seeds are typically cold pressed to extract the nutritious oil. This form of extraction is similar to the way that olive oil is taken. You can often find hemp seed oil in food markets by olive oil, coconut oil, and almond oil. Hemp seed oil can be used as a replacement for butter and is known for its nutty taste. This oil is filled with high amounts of unsaturated fats, omega-3, and omega-6. These healthy fats and fatty acids have many uses, including health and skin care benefits. This is why it is not surprising that hemp seed oil has been used in many different cultures for hundreds of years. Hemp seed oil has anti-inflammatory, antioxidant, and moisturizing properties, which offers many benefits both inside and outside the body. Some of these benefits include balancing hormones, lowering cholesterol, and restoring damaged skin cells. There are many other health benefits that hemp seed oil offers. If you would like to learn more, check out this link. The fatty acids found in hemp seed oil are able to moisturize and repair inflamed skin without becoming too greasy. This is because it almost mimics the skin’s natural lipids, so the oil provides just the right amount of hydration. Those with oily or acne prone skin will be happy to hear that! CBD oil can also be taken from hemp plants but is extracted from the stalks, leaves, and flowers of cannabis plants instead of the seeds, like hemp seed oil. Another major distinction is that CBD oil is not limited to cannabis strains containing less than 0.3% THC like hemp oil. Now here is where it gets a bit confusing, so pay close attention. Since CBD oil can be derived from different strains of cannabis, it can have varying effects. For example, hemp CBD oil is extracted from cannabis sativa plants that fall into the “hemp” category with low levels of THC as mentioned earlier. With such minimal amounts of THC, the ratio of CBD to THC is high and there is no need to worry about any psychoactive effects while enjoying the benefits that CBD offers. CBD that is extracted from strains of cannabis that have higher levels of THC will reduce the CBD to THC ratio and may result in a high. For the sake of this article, we will mainly be focusing on hemp CBD, derived from hemp plants, to avoid any THC ramifications. CBD can affect the body through the endocannabinoid system, ECS. This system regulates many different bodily functions such as your mood, memory, sleep, appetite, hormone regulation, pain, and immune response. 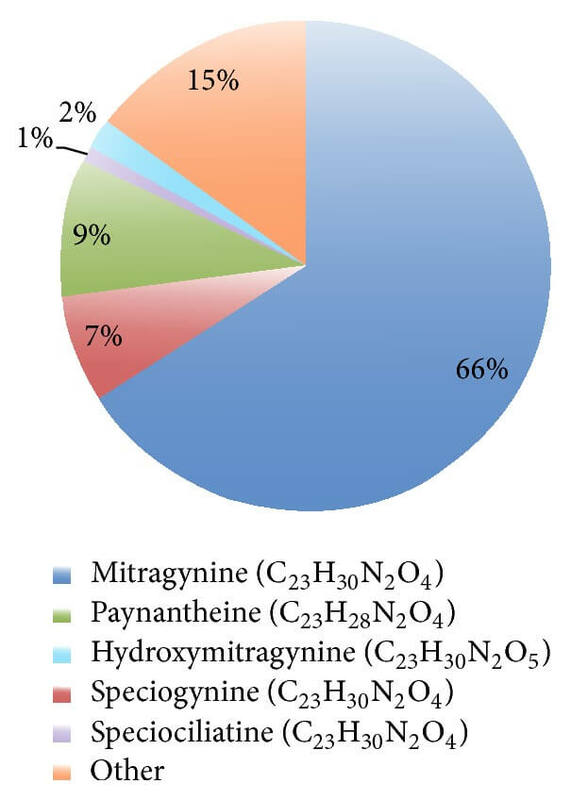 The ECS also creates natural cannabinoids within the body. The cannabinoid receptors CB1 and CB2 have been found to be directly affected by CBD. CB1 has to do with brain function, while CB2 is involved with many other cells, including the immune system. CBD oil can be used for a variety of purposes, but originally became “popular” for medicinal reasons. This oil is often used by those with chronic pain, anxiety, insomnia, seizures, and muscle spasms. Research for the medicinal uses of CBD continues to expand its list of benefits. Recently CBD has been showing up in beauty products as a new trendy ingredient. Although it has been used for years in medicinal creams and balms, it is now being used to help beautify your lashes and skin. But what are the benefits of having CBD oil in your beauty products? The reason for the sudden popularity of CBD oil being used in beauty products is not just a gimmick for sales, it really does offer many benefits. This oil has antimicrobial properties that stop the spreading of germs and bacteria, which is always a favorable characteristic when it comes to any skin care or cosmetic product. CBD oil is also an anti-inflammatory. The reason for many skin problems, such as acne or eczema, is inflammation. Moisturizers and other beauty products with CBD oil are able to effectively help reduce these common issues. Moisture levels of the skin are also able to stay balanced with the power of CBD oil as it can improve the amount of hydration that your skin holds. It also works effectively to provide moisture to delicate areas of the face, such as under the eyes. If you are worried about signs of aging, CBD oil can be a solution for you as well. It has been shown to help reduce the signs of aging such as wrinkles. This magical oil also has antioxidant properties that can be compared to vitamins C, E, and A. This means it can help protect your skin from pollutants or other environmental stressors that may cause premature signs of aging. Can I Buy Beauty Products with CBD Oil from Amazon? Now that you know all the amazing benefits of this natural ingredient, I am sure you are wondering Ok how do I get my hands on a beauty product with CBD oil on the ingredient list? Well, it is actually more difficult than you would think. In fact, one of the biggest online retailers, Amazon, does not sell any products with CBD oil on their website. It goes against Amazon’s Selling Policies and Seller Code of Conduct, as CBD oil is considered to be drug paraphernalia by the company. This goes on to include synthetic CBD, cannabidiol products, and rich hemp oil with a high concentration of CBD oil. You may notice that if you search CBD oil on Amazon plenty of results will still show up. These products that appear are usually just hemp products, although some sellers do make claims that the hemp or hemp seed oil will have the same effects as CBD oil, which is untrue. Amazon is not the only website or store with cold feet about CBD oil and other related products. Many stores and online marketplaces are creating hurdles for companies that wish to sell products containing CBD. This is due to the possibility of legal issues due to the legal, classificatory and regulatory gray area in which CBD oil and other CBD containing products currently reside. The retailers that do not wish to carry these products are simply not willing to take the risk. They want to ensure that they are staying aligned with the federal rules and regulations. In the United States, hemp seed oil is legal in all 50 states, while products containing THC are only legal where marijuana has been legalized. CBD derived from hemp plants can still be considered legal though because of how little THC the plants contain. There is also a technicality about which parts of the plant it is extracted from (certain parts of the plant are excluded from the Controlled Substances Act’s definition of marijuana). Many stores do not know what to do with CBD products, however. For example, Target temporarily sold CBD products online but ended up taking them off of their site. This conflict that stores have with CBD is due to a few factors. The first is the confusion of the legality of the products. There is also the problem that quantity and quality of CBD in CBD containing products are not currently nationally regulated. Then there are issues with the claims that the companies make about their products, which some retailers are afraid are not all true. Companies in the past have made false claims and most retailers do not want to peddle “snake oil” to the unsuspecting public. Moreover, making anything that too closely resembles a medical claim puts companies in conflict with the FDA. There was a warning issued to four companies that were selling CBD oil and other similar products regarding statements of uses. This warning came right from the FDA in November of 2017 and stated that the companies could no longer make unproven claims about cancer treatments. The warning recognized that there was a potential for marijuana and cannabis to be a possible treatment, but until there was more research and hard evidence that such claims could not be made on the companies’ websites. To view the official statement from the FDA, click here. There is also a growing fear that pharmaceutical companies will take over the hemp and CBD industries. This fear has increased since the first drug with CBD being approved in April of 2018. The prescription drug, Epidiolex, is meant to help treat rare/severe cases of epilepsy. Due to the unsteady environment that surrounds the future of CBD, many companies are now finding it difficult to find financial backing or even an online platform to sell their products from. They have to deal with the FDA and DEA as well. This makes it much more difficult for consumers to enjoy the benefits that CBD oils and other CBD containing products have to offer. Who Is Carrying CBD Products? Some companies have been able to work through the current difficult situations to still produce great products that you can find online. Also, many dispensaries in states where marijuana is considered legal will carry beauty products that contain products with CBD oil. Dispensaries are also able to carry products with much higher THC content, which some believe will have more of an impact when using healing creams. There are two big names in beauty that have taken a small dip in the CBD product pond. In April, one of the biggest names in the beauty industry, Sephora, known for selling cosmetics, skincare, haircare, fragrances, and stealing all of my money, started to sell the CBD mascara that shook the internet. When this mascara launched it had everyone talking. Although Sephora had been selling some of the top hemp cosmetics for many years, this was their first CBD oil product. 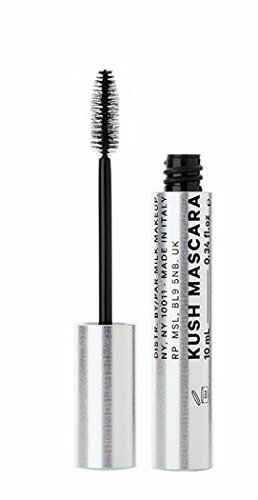 Kush Mascara is a new product that came out this year from Milk Makeup. Although it seemed like a publicity stunt, there was actually a legitimate reason for the addition of CBD oil in the mascara for more than shock value. The company decided to go 100% vegan, which caused them to switch up all of their ingredients. This meant that the beeswax that they were using in previous formulas had to go when creating their new “high” volume mascara. It was replaced by CBD rich cannabis oil as a binding component in the mascara formula and also as a conditioner. The Kush mascara is a volumizing vegan mascara that thickens lashes with heart shaped fibers (the heart shaped fibers add volume and curl your lashes). These fibers are fused to your natural lashes with the help of CBD oil, so you don’t have to worry about fall out. Only a small amount of CBD oil is in each tube of mascara and no THC is included in the formula. From what we can tell reading/watching the reviews, this stuff really works. Everyone seems to love this mascara. Check out this video review here to this mascara in action. So, that’s one win for a CBD product created by a very popular makeup brand being sold in stores and online by a very well-known beauty store. But is that just because it is such a small amount? Side note, if you want to see just how into cannabis inspired products Milk Makeup is getting, check out their Roll + Blot Papers. They can work as blotting papers or rolling papers, very efficient if you ask me. Though apparently, these are not condoned by Amazon or Sephora. Moving on to another beauty company that is on the front line of stocking great CBD beauty products, Credo Beauty. Credo is pretty much a clean beauty/natural version of Sephora that has begun to sell a brand known as Vertly. They carry all of their non-THC products online and in their 7 stores throughout the country. Vertly is an entire beauty company that is dedicated to using hemp cannabinoids, CBD, and other plant-based ingredients for the optimal wellness and indulgence of their customers. This company was founded by a couple in northern California that wanted to create a clean beauty line. This husband and wife were not just looking to create any natural beauty line though, they aspired to use the healing powers of hemp and cannabis in their products to bring natural healing to their customers in a different way. Their CBD filled product list includes body lotions and lip balms that are produced in small batches to assure freshness, quality, and efficacy. The cannabinoids used are absorbed through the skin from daily use, just as a vitamin or supplement. They offer two types of body lotions online. One is more concentrated with hemp derived CBD to provide relief for muscle and joint soreness. The other body lotion is meant for daily use to soothe, refresh, and hydrate your skin, also containing CBD. They use hemp derived CBD in their lip balm as well since the anti-inflammatory properties can help heal any damaged or chapped lips. This lip balm is also filled with many other hydrating ingredients such as shea butter, coconut oil, and cocoa butter. It is available in two scents, peppermint and rose. This company is able to combine powerful, yet simple, ingredients that provide real results with sleek packaging. Although there are many hoops that beauty companies using CBD oil in their products are having to face, many more companies will probably be adding it to their ingredients list. The “hype” of CBD oil right now will get many companies on the bandwagon. It is becoming increasingly popular as people are getting more informed and looking into clean beauty lines. CBD oil is a great ingredient to use as an alternative to other ingredients when making a natural product. It makes a great substitute for petroleum for example. There is also the obvious reason for companies to include CBD in products, all of the benefits that CBD oil offers. It is a great choice for skin care, especially for smaller brands that want to make products that appeal to a larger customer base, as CBD oil can be beneficial for all skin types. Those with dry skin will love that it helps to hold moisture onto your skin by strengthening your skin’s natural barrier. Too much oil production is balanced with CBD oil, leaving oily skin properly hydrated without looking or feeling greasy. 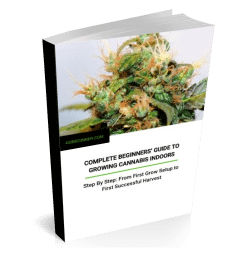 CBD oil is known for usually not causing allergic reactions, since it is anti-inflammatory. This makes it great for sensitive skin. It is also gentle enough to put on areas of skin that are very delicate and need a light touch, such as the under-eye area (it may even help with puffiness of that area). The anti-inflammatory properties are also great for those that have psoriasis or acne-prone skin. Acne prone skin will also benefit from CBD oil’s antimicrobial properties that help the spread of bacteria, which can translate into stopping the spread of breakouts. Sweet! The antioxidant properties of CBD oil help create a barrier between your skin and outside pollutants and other environmental stressors. This may help from speeding up the aging process. Who doesn’t love an anti-aging product? Using hemp seed oil in beauty products is nothing new to write home about. 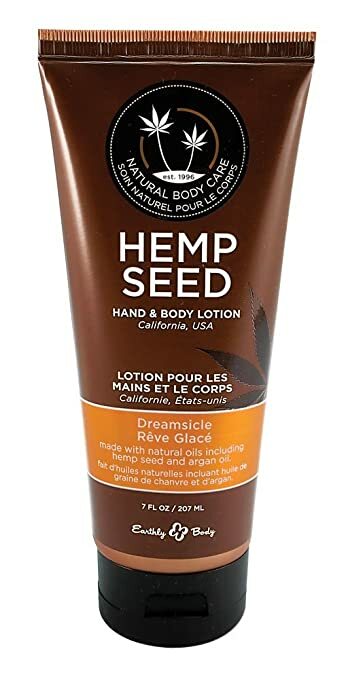 Do you remember using the Body Shop hemp products in middle school and thinking you were so cool? Well, there was more to that. There is a reason hemp seed oil has been used for hundreds of years and continues to be used in top hemp cosmetics. This nourishing oil is full of vitamins, minerals, and fatty acids. It also contains antioxidants and anti-inflammatory properties. One of the main reasons is that hemp seed oil is a great moisturizer. It is able to help restore the skin barrier by almost stuffing the gaps between skin cells. This reduces water loss and shuts out irritants. Allowing your skin to maintain proper hydration. By protecting your skin from outside irritants and environmental stressors, you are able to prevent some stressors that may cause premature aging. One of the acids that hemp seed oil contains is gamma-linolenic acid. This acid is necessary for healthy skin growth, making hemp seed oil able to easily heal skin. Hemp seed oil has been known to help with acne due to its anti-inflammatory properties. It is also a non-comedogenic oil, so it will not clog pores, another bonus for those with acne prone skin. The amino acids found in hemp seed oil are also known to help build healthy and strong nails, which I know we all need if we spent a few months, or years wearing gels or acrylics. Now that you know all the benefits, here are the top hemp cosmetics that you will love. Kate Somerville is one of the top names in skincare, so it is no surprise that this age defense moisturizer has a ton of great reviews online. This cream uses hemp seeds as one of the key firming ingredients along with babassu seeds and Oligopeptide. 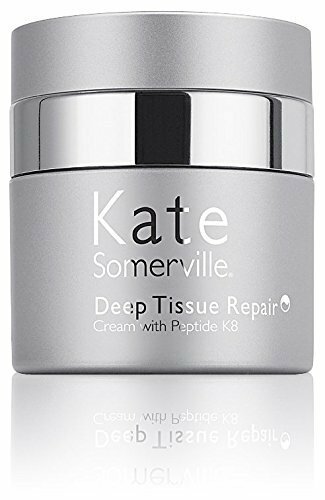 The cream is also formulated to diminish the look of wrinkles, both their depth and density, with Kate Somerville’s Advanced Ceramide Infused Peptide. The company’s advanced Moisture Complex aids in helping skin to stay balanced and prevent water loss, keeping skin looking plumper and more youthful. This product was created to provide immediate moisture, increase the firmness of the skin, and minimize signs of aging, such as fine lines and wrinkles. If you are looking for a new anti-aging cream that uses the “magic” of hemp seed oil, this is a great one for you. Chapped lips are something that haunts many of us. So, finding a great lip balm can be a difficult task. 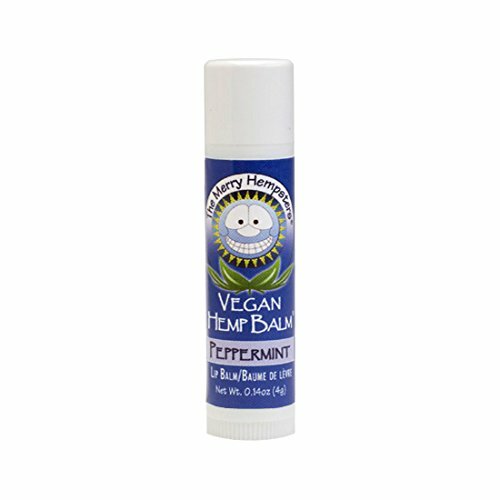 The Merry Hempsters created this vegan lip balm in a delicious peppermint flavor that truly helps to keep your lips hydrated. This lip balm includes the conditioning ingredients of hemp seed oil, vitamin E, and rosemary to help keep your lips from getting cracked. This old favorite moisturizer has been around for years, and for good reason. 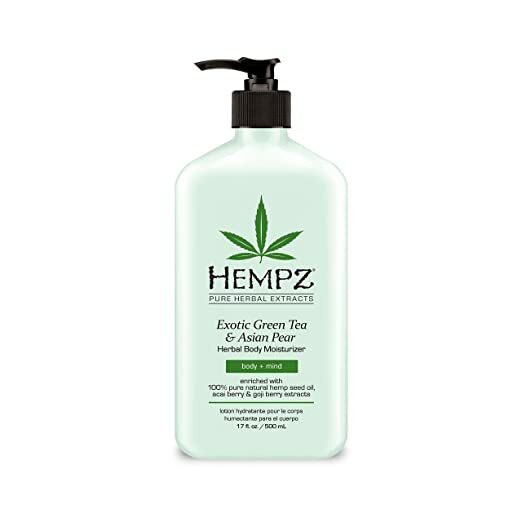 Hempz body moisturizer uses hemp seed oil, vitamin C, and vitamin E to keep your skin hydrated and protected from environmental stressors. For those with very dry skin, this is a great option because it truly provides superior hydration and helps to regenerate skin cells. But if you are looking for something natural, this not the lotion for you. Marrakesh Hair Care Argan and Hemp Styling Oil utilizes the moisturizing and nutrient-rich properties of both argan oil and hemp seed oil to give you good hair days every day. This oil will help to make hair feel silky and smooth. It can also help with blow drying, as it is supposed to cut your drying time in half. The hemp seed oil and argan oil blend is meant to keep hair frizz free and shiny. It has great reviews on Amazon, with some saying that their stylists recommended it to them. The reviews also say that the oil is lightweight and doesn’t make their hair feel oily. Hand lotion is a handbag/nightstand essential. This is for a few reasons. One, having soft and hydrated hands is always nice. Two, hands are one of the first places to show age, so using a hand cream with good ingredients can help fight that. This is a hand and body cream from Earthly Body has hemp seed oil and argan oil, both nutrient and moisture rich. These babies also come in some great scents like dreamsicle and lavender. You can purchase the larger size to use as body lotion, but we think the smaller ones are perfect to keep your hands and cuticles hydrated on the go. Are you feeling like you need a bit of tan? 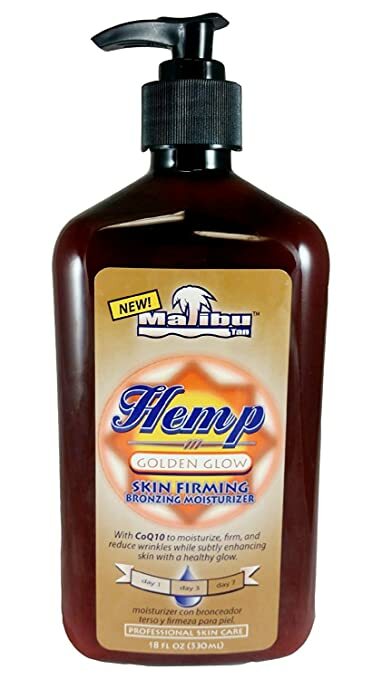 This firming body lotion from Malibu Tan moisturizes while slowly deepening a tan over the course of a week. It contains DHA to help darken the color. The color that is applied goes on without being streaky and gives a radiant glow. CoQ10 is on the ingredient listed to help moisturize and firm skin. Hemp seed oil is included to keep skin moisturized. One thing reviewers note is that although the smell is nice when it first goes on, the reviews say it has a fruity scent, it does begin to smell like a normal fake tanner as the day goes on. So, just keep that in mind. This lifting face cream made with organic hemp seed oil helps to keep away wrinkles and fine lines. Although this isn’t a facelift in a jar, it is filled with great ingredients that will help to keep you looking younger. These ingredients include green tea and ginseng extract. With the antioxidant properties of vitamin C, vitamin E, and hemp seed oil that this cream contains, it helps protect you from pollution and other environmental stressors. This is a cream and not a lotion, and is recommended to be used at night due to its thick texture. Also, keep in mind that a little goes a long way. This cult favorite soap is known for being natural, vegan, and certified organic by the USDA national organic program. 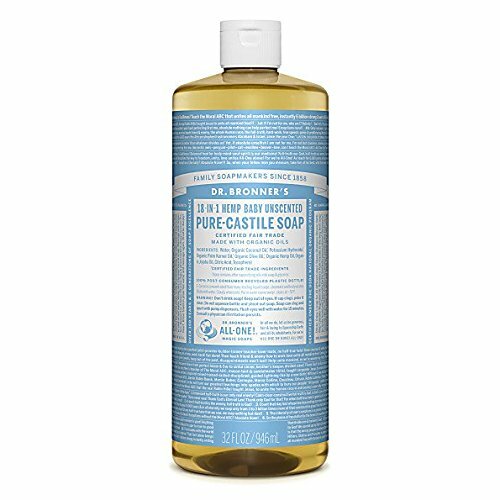 This soap can practically be used for anything but since we are talking about the top hemp cosmetics, we will just focus on how amazing it is as a body wash. Dr. Bronner’s Pure-Castile Liquid Soap helps moisturize your body while it cleanses, without any harsh ingredients. Along with coconut and olive oil, hemp oil is included on the ingredient list. This body wash also offers you many different scent options; such as lavender, eucalyptus, and peppermint. If you have very sensitive or irritated skin, this soap may help clear up any inflammation without drying out your skin. This cleansing bar helps to ease irritation, decrease swelling, and alleviate redness. It is filled with ingredients to help calm the skin. Indian Hemp oil, shea butter, calendula, and neem oil are all found in this simple cleansing bar. There is nothing that can replace a great face oil in your beauty routine. This oil from Jeffrey James Botanicals might just be your new go to. It gives you a healthy, hydrated, and glowing complexion, without appearing oily. The way that this product is formulated allows it is able to soak into your skin easily, leaving just a radiant appearance behind and not an oily canvas. You can look at the ingredients list and you won’t be surprised why this oil works so well. Geranium helps your skin to look brighter by stimulating cell regeneration and circulation. Jojoba oil adds moisture and tightens pores. Hemp seed oil also aids in hydration, along with many other ingredients. This oil is meant to be used as a part of your daily night routine, which is totally appropriate for this luxurious oil. Although hemp seed oil is not the star, this is one of our top hemp cosmetics and our editor’s pick because of how great this product is. I am a sucker for anything that will make my skin glow, what can I say. You can buy the top hemp cosmetics in store and online pretty easily, but as you read above CBD products are harder to come by. You can always make your own natural skincare at home and it is easier than you think. Here are two simple recipes that you can try. No matter the time of year, it is always nice to have a gentle exfoliating scrub to remove the dead skin from your body. Exfoliating once a week is a good practice to help keep your skin smooth, glowing, and moisturized. 2 tbsp of carrot seed oil – This moisturizes, supports healthy skin, contains antioxidant, and helps keep away bacteria. Combine all of the ingredients together into the container of your choosing, it should create a paste. Once it becomes a paste/scrub consistency, begin to scrub and exfoliate your body with the mixture. Then enjoy your glowing, soft, and hydrated skin. Note: This acne treatment does not have exact measurements. It all depends on the size of the spot you are covering and if you are covering multiple spots. Tea Tree Oil – This is a great oil for treating acne naturally, without completely drying out your skin. Take a small amount of baking soda and put it onto a small plate. Then add just enough CBD oil that it creates a paste. Then add 1-3 drops of tea tree oil. Apply the mixture to your spot. If using your fingers, make sure that they are washed and clean. The best way to apply, especially for multiple spots, is to use q-tips and only use one end for each spot. This will stop any bacteria from spreading and creating more breakouts. Let it sit for about an hour and rinse. This treatment can be repeated daily until your spot disappears. The difference between hemp seed oil and CBD oil can sometimes be overlooked but it is certainly something that retailers, banks, and the government are paying attention to. Each oil offers different benefits but both are starting to show up more throughout the beauty industry. What do you think of our top hemp cosmetic picks? Did we miss your favorite? Have you tried one of the new CBD oil products?